We were all children once. Childhood is the time of dreams and fantasies, when our imagination craves great adventures. I wonder if there’s a child who has never dreamt of becoming the king of an enchanted, beautiful castle? It was my dream when I was six. 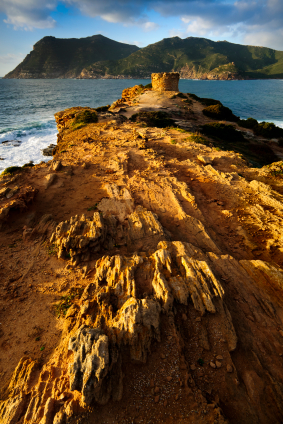 I grew up in Sardinia, listening to the legends of the proud guardians of the Sardinian coastline. My favourite locations were the coastal towers: They’re scattered along the edges of the whole island, from Cagliari to Alghero, from Oristano to Siniscola, placed to form a big protective circle. My Sardinian history teacher was my grandfather, an old fashioned sailor. He was a charming middle-aged man. His broad shoulders and rather serious demeanor gave him an authoritarian look, but he had kind eyes. He loved to enchant me by gesturing with his knotty hands, telling me about the Sardinian silent watchers… Built to resist the pirate’s incursions, the towers were managed, equipped and defended by the Royal Tower Administration, a proto-agency based in Cagliari. A stone in Uras dating back to 1546 stands as a witness of one of the incursions by the infamous Red Beard, or Barbarossa as we call him (his real name being Khayr al-Din). The towers were placed in a way that allowed the watchers to communicate using visuals and sounds, without leaving their stations… a little bit like when I was in front of my grandpa and my thoughts started running as if into a dream world.